Another brisket sandwich, but with a Peruvian twist. If you presented me with the tall task of naming the Top 10 eateries in Pittsburgh, you might have to check back in a year or so for your answer. However, there are a few that are shoe-ins: the legendary Primanti Bros. Sandwich Shop, Dish Osteria & Bar… and the unheralded Chicken Latino. Since their opening in 2007, Latino has been doling out authentic Peruvian cuisine down in the Strip District. Their calling card is the Peruvian chicken they prepare, which is absolutely heavenly. However, you know me; I’m a brisket kind of guy. So when their Facebook page advertised that they were serving up just that, a trip to the best Latino restaurant in the city of Pittsburgh was in order. Latino always puts me in a good mood; more often than not, you’re greeted by Shelby, the owner and chef of all things Chicken Latino, and from there the atmosphere just becomes more and more welcoming. Every one of the waiters and waitresses (their staff is small in size, but not quality) is personable and will strike up conversation. It’s simply a fun place to be, not to mention being able to eat Shelby’s food as well. About the food… impeccable. Everything is seasoned to perfection with specific Latino spices for each meal, and everything’s as fresh as can be. The Brisket Sandwich was no exception. Now, looking at the picture above, you may be a little underwhelmed by the simplicity of the sandwich. Didn’t you learn not to judge a book by its cover? Although it consists of only brisket, bread and barbecue sauce, this could be another one of the best brisket sandwiches I’ve ever had because the minimalist approach allows the meat to shine. And boy does it. As soon as you pile on the barbecue sauce and take a bite, you’re hit with the brilliant seasonings. It’s classic brisket taste with a twist of Latin spices; combining the South and South America. 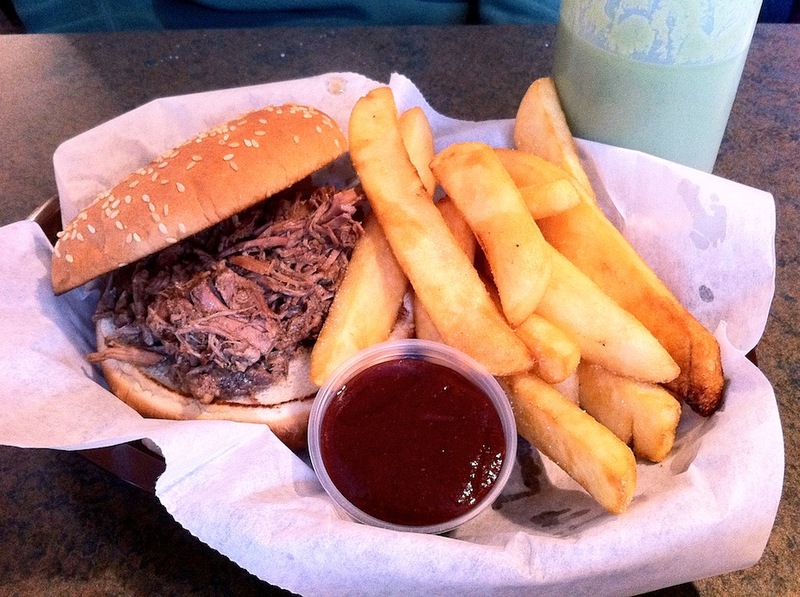 There’s a certain savory saltiness to the meat that is unique to this sandwich, but for you salt-a-phobes, don’t worry; the taste is simply a compliment to the consistency of the brisket and the delectable barbecue sauce. It’s just there for a little something extra. Now, as a veteran of Latino, I feel it’s my duty to divulge a little insider information… alright, not “insider” information, but key info nonetheless: PUT THE GREEN SAUCE ON EVERYTHING. Disclaimer: it’s spicy. Disclaimer 2: it’s unbelievable. Made from habanero peppers (yes, the spiciest in the world), the sauce has a distinct taste that is fairly indescribable, but believe me when I say it goes with everything Shelby’s serving up. Watch yourself the first time; the heat’s pretty gnarly. But once you get past the initial pain, you’ll keep going back for more. Chicken Latino is almost undoubtedly the best authentic foreign restaurant in the city of Pittsburgh, and easily one of the 10 best eateries in the city as well. Everything is prepared not only with authentic spices and flavors but with authentic intent; when you order food here, you know that Shelby’s going to do everything she can to make you happy. If you ever find yourself in the Strip and are growing weary of Primanti’s sandwiches (I know, preposterous but possible), make sure to hit up Latino for a lunch as satisfying as you’ll find anywhere. Very well written. The touch of humour you added made this post even better. I was a little skeptical at first, I must admit, I thought that perhaps it would be a little too simple. But you have completely proven me wrong. I think I might have to go and check out this place sometime.